Grit Leader done in by the media? You read it first in The Tyee. When Stéphane Dion announced his decision to step down as Liberal leader on Oct. 21, he blamed his dismal showing on a Conservative ad blitz that kicked in as soon as he won the party leadership in late 2006. The advertising onslaught questioned his qualifications for the job, helping “define him with the public and he never recovered,” the Globe and Mail reported the next day. Dion done in by Tory ads became the story of the week in the commercial press, as papers across the country jumped on the bandwagon. Some in the media questioned whether the ads alone could make Canadian voters turn their backs on the Liberal leader. “The commercials would not have worked if they didn’t seem true to the electorate,” offered a National Post analysis. Someone needs to explain to Dion “that attack ads only work if they are grounded, however tenuously, in the truth,” a Winnipeg Free Press editorial chimed in. But nowhere in the discourse was there recognition of a factor even more defining in bringing down Dion — the reporting and commentary in the news media themselves. Most Canadians have never met Dion. Their knowledge and impressions of him are mediated by the press. 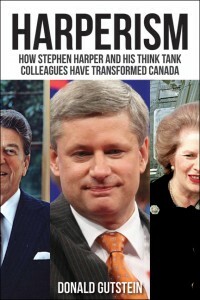 And the press, with the Aspers’ National Post and Mike Duffy’s Countdown on CTV leading the pack, gave Harper and the Conservatives nearly unlimited access to their audiences to disseminate the Conservative message, as The Tyee reported in March 2007. If the commercials seemed true to the electorate, it was because the media were repeating the same message in their news stories and commentaries. It was the combination of paid (ads) and free (news stories and commentary) messaging that did Dion in. But the role of the media in that endeavour has been pretty well expunged from history. No sooner was Dion crowned leader than the Conservatives pulled out all the stops to implant a Dion-as-flip-flopper frame in voters’ minds, attempting to define Dion for the voters before Dion did it himself. For this work, they turned to Frank Luntz, then a prominent Republican spin doctor, a master at framing the political debate through his use of language. He’s credited with the Republican takeover of Congress in 1994 via his bogus Contract with America. Luntz visited Canada in May 2006 to meet privately with Harper and to address the shadowy Civitas Society, whose members include Harper’s then chief-of-staff Ian Brodie, his long-time political mentor Tom Flanagan, and Environment Minister John Baird. Montreal Gazette reporter Elizabeth Thompson heard Luntz tell the 200 libertarians and neoconservatives that voters want someone who is credible and they can trust more than someone who shares their ideas. “More than anything else, they want to know you are a straight shooter,” he added. Luntz assisted George W. Bush eke out his narrow victory over John Kerry in 2004 with similar messaging. Google “John Kerry” and “flip flop” and you’ll still get 250,000 hits four years later. In 2004, you would even have found a brand of footwear called the John Kerry flip-flops, which were perfect to wear to the beach. That’s where you’d find Kerry — or on the ski slopes — while his rival was busy in Washington looking after the nation’s business. Bush, the straight-shooter; Kerry the effete flip-flopper. After Bush featured Kerry’s flip-flopping as a central theme in his 2004 convention acceptance speech, Luntz asked swing voters in Ohio to give him one word to describe Kerry. The top answer was “flip-flop.” The message got through, and Luntz must have been satisfied. Bush won Ohio and Ohio gave Bush the presidency. Of course, we must remember that the state Republican administration ensured that 357,000 Ohio voters, the overwhelming majority of them Democrats, were prevented from voting or did not have their ballots counted. Harper can’t rely on such shenanigans to get him elected in Canada, so the Dion-as-flip-flopper frame had to do some heavy lifting for the Tories. And thanks to an obliging media, it worked here, too. Harper kicked off the flip-flop campaign in the House of Commons during the debate over the extension of sunset provisions in the Anti-terrorism Act regarding preventive arrests and investigative hearings. The Liberals had enacted the law in 2001 and Liberals were voting against an extension. This was a flip-flop of colossal proportions, they charged. The accusations of Liberal flip-floppery were relentless, occurring 33 times over the next three weeks. Most were about the Anti-terrorism Act, but accusations of flip-flopping spread to Liberal policies on Kyoto and sending troops to Afghanistan. Harper himself used the term five times. One vehicle for disseminating the flip-flop message was the nightly Mike Duffy Countdown segment on CTV, where the Conservative frame was provided a friendly welcome. Anti-Dion ads played during the commercial breaks were reinforced by Duffy’s guests. Government Whip Jay Hill led off by slamming “the flip-flop on Afghanistan, or the flip-flop now of the anti-terrorism act …” Next, Public Safety Minister Stockwell Day skewered Dion’s flip-flop on the anti-terrorism law and its implications for the Air India investigation. Jay Hill was back several days later, as the vote on the anti-terrorism law extension neared. Harper appeared the same evening, repeating the phrase “abruptly flip-flopped” he used twice in Parliament. Apparently abrupt flip-flopping is worse than gradual flip-flopping. Conservative strategist Roxanna Benoit couldn’t understand why Dion needed to flip-flop, parliamentary secretary Pierre Poilievre hoped Dion would flip-flop once again on the environment and backbencher Garry Breitkreuz accused Dion of being like a fish out of water, going flip, flop, flip, flop, repeating the phrase for the benefit of slow learners in the audience. Harper has changed his mind more than a few times. Think of his about-faces on Kyoto and taxing investment trusts. But few in the media called him on it. And while Dion’s flip-flops demonstrated weakness, Harper’s were a sign of strength, at least according to National Post columnist Don Martin. After slagging Dion for most of his column, Martin then writes, “to be fair, Prime Minister Stephen Harper has been known to change his mind. Just ask income trust investors.” Harper the straight-shooter changes his mind. Dion never changes his mind, just flip-flops. And a few days after that, another Post editorial reminded readers of the “already long list of Liberal flip-flops, which includes … Afghanistan, the Anti-Terrorism Act, Bill C-257… the rehabilitation of Adscam bagmen… and a carbon tax on fossil fuel consumption.” Whew! A week later, a Post editorial mused that Dion’s “new policy stance on law-and-order issues” incorporated a flip flop. Hmmm. Wonder how that happened.